High places (62), Pedestrian street (100). Notwithstanding the development of greenways, paveways and blueways, it will become increasingly difficult to provide quiet and sunny space in downtown areas. Roof gardens are becoming popular but they tend to be at the dead ends of the urban circulation system, even more isolated than the New York Plazas that William H. Whyte found to be deserted because they are not on circulation routes (Whyte, 1980). 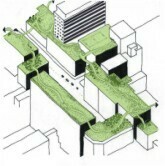 Developers should provide roof gardens, and they should be linked into a network of skyways (Figure 10). The network could be used by office workers at lunchtime for jogging, sunbathing, eating and playing games. Open air baths, conservatories, wildlife habitats and caged-in games pitches should be incorporated into the skyway network. Connected buildings (108), Roof garden (118), Arcades (119), Zen view (134). See New York as it should be - with vegetated roofs.